Although the female is the biting mozzie, the key to eliminating mozzies is to kill off the males (the ones that don't bite). Mozzies don't travel far, so if you kill off the males, you eliminate the population entirely. 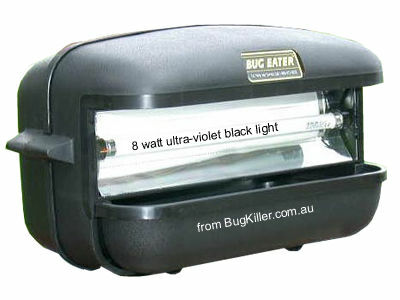 The bugeater has a specially formulated UV light that attracts the male and then drowns it. No high voltage and no poisons. What we are talking about here is a long term approach to mosquito control, not just a quick fix. So while your immediate concern is the little devils that are biting you now, the solution is to target and eliminate the entire breeding population! After using the bug eater, there is a noticeable drop in the population after 2 weeks, and with in a month of using it there are virtually no more mozzies. You need to think about the bugeater differently to other bug catchers/repellers. If you turn on the bugeater every night from dusk to dawn, it will actually eliminate your mozzie problem! You will see a difference within two weeks, by 4 weeks you will hardly be bothered by mozzies at all. It is the female mozzie that bites, the bugeater is designed to catch the male, thus destroying the breeding cycle. However it is not necessary to turn it on while you are using your outdoor area. In fact you can remove it if you think it is out of place while you are entertaining. So unlike other bug devices this one works when you are not there! BUG EATER lamps are specially engineered to provide the greatest attractant effectiveness. The BUG EATER bulb has proven to be the most effective light available. Imitation and cheap imported lights may look the same but are not as effective. The UV from BL or BLB lamps is the key, they can glow but UV may not be transmitted, if this is the case change the tube. OUTDOORS The BUG EATER is a directional insect control management device used around your outdoor living, business or Agribusiness area. The basic concept is to lure insects away from the areas where you play, relax, cook, swim or work. Being directional BUG EATERS draw the insects from areas you want to protect. If possible, it should not compete with the setting sun or night lights for the best result and maximum insect's attention. It works on line-of-sight, so the more bugs that can see it, the more it will attract and drown. For Agri-Business the placement will change depending on needs. The BUG EATER may be used freestanding, on a table, mounted on a tree, fence, or the side of a building, such as a tool shed or garage. For your convenience a mounting bracket and screws are provided. Extras are available if required. The unit is easily removed from the mounting bracket and is portable. Do not (except in special cases) mount the unit higher than six (6) feet above the ground. Move the unit around. For optimum results, your outdoor unit should be operated all night - on at dusk, off at dawn. Maximum efficiency is reached after twenty one (21) days of operation. The Black light UV tube is not like normal lights as it powers up the contents of the tube, such as lead, mercury and other elements. The power supply is important to make sure the bulb treats emissive material correctly so it can radiate the UV. Poor power, such as brown outs, thunderstorms, surges or intermittent use may shorten the life of the black light lamp. The SK-14A light consumption is proximately that of a 25-watt incandescent bulb or about 0.6 kW per 24 hours. There is no warranty on bulbs. Winter months (depending on climate) generally means the unit can be turned off or stored. Years of uses show that whilst there may appear to be no insects to speak of it may be worth turning the unit on before single insects start emerging and breeding into thousands. Disconnect power before working on the unit. Use a screwdriver or finger, insert in slot at center along the bottom edge of the lens. Gently pull the centre of the lens away from the unit to remove the lens allowing access to the lamp. The lamp is removed by rotating the lamp approximately a quarter turn in either direction. The starter in the SK-14A model is located at the rear bottom right of the unit. It is advisable to replace the starter with the tube in SK-14A models. BLACK LIGHTS - There are two different types used in Bug Eaters. (1) White Tubes (BL)- FL8BL Come standard with all Bug Eaters and give off a bright white light as well as the required 350 nanometers of UV. These lights can also act as a security light in most cases. (2) Black Tubes (BLB) - F8T5BLB These black light blue tubes are available as an accessory. They have a black/blue coating on the tube to filter out the white light and just leave UV being transmitted. These lights may be preferred in areas where a bright light is not required - such as in hotels, resorts and where white light is a nuisance to others around. Most pesty insects are night flyers and are attracted to a spectrum that comes from a black light source. BUG EATER lamps are specially engineered to provide the greatest attractant effectiveness for outdoor & indoor protection. The BUG EATER bulb has proven to be the most effective available. A BLB tube (black in appearance) may be more effective in some coastal sandfly areas or other specialised applications. 240 volt Extension cords for outdoor use are to be marked with the letters - SJW-A, SJEW-A or SJTW-A or equivalent AS/NZS Standards. Disconnect unit from the power supply before servicing, when changing bulbs, cleaning etc. Do not insert foreign objects into this product. Power Pack. Do not use in wet or moist areas. Be sure to cover if used in the open or outside. Add a squirt of any household liquid detergent to the tray for best results. Avoid highly scented ones. Fill tray with water to the level of the line. The soap breaks down the surface tension allowing insects to drown once being blown downward into the water by the fan. Plug the unit in and leave running. Check the water level in the tray regularly. CAUTION: DO NOT IMMERSE ANY PART OF THE BUG EATER UNIT IN WATER EXCEPT THE SLIDE-OUT TRAY LENSES OR REFLECTORS. Clean your units Perspex lens periodically to insure maximum airflow & ultraviolet radiation. Remove or cover any stagnant water that may be around affected areas. Remove possible breeding grounds such as water in containers, tires, buckets, drums, s-traps, down pipes, check septic systems etc. Cover with mesh sumps, down pipes septic or drains to stop adults laying larvae that continue to hatch, as it helps the BUG EATER do its job. The idea is to catch the adult before it lays larvae and eggs re-infesting the area. Make sure gutters and ground areas do not retain ponding water. Remove any excess debris, material or leaves in gutters gardens and surrounds, keep lawns mowed. Watch pot plants for any build up of water in sump traps. Flush all pots with water at least every 21days to be sure the breeding cycle of insects like mosquitoes is interrupted. Neighbours: The adjacent property can greatly affect the local infestations and bring in more problems to your area. Historical information reveals that if a number of adjoining properties have BUG EATERS, it breaks the breeding cycle in the area, which then leaves less chance of re-infestation. Encourage your neighbour to buy a BUG EATER also; you will be doing them and the area a favour. Recycle the catch into the soil or compost. The catch of insects helps build up the constitution and structure of your garden soils, which improves worm numbers and soil texture. The decomposing bugs combined with household waste in a compost bin will help the return of worms and organisms to your soil and can assist in reducing the use of fertilizers. Birds are insect's natural predators, so just leave the tray out each morning and soon you will see a congregation of wildlife every day. If they're good bugs, at least they end up in the natural food chain. Female Mosquitoes are the only mossie that bite looking for protein (blood) for their breeding cycle. Once fertalised by the male they lay at random up to 1,000 eggs. The male dies and the female lives on to multiply. A female mosquito will generally go to carbon dioxide; heat or body smells of humans, birds or animals looking for blood. A BUG EATER will not always catch a female when humans are around, but it will catch the male - hence breaking the breeding cycle. Mosquitoes do not travel far in a lifetime. In fact it is said that generally only 75meters on average, except if caught in a wind. Your mossie problem will most probably be caused by localized breeding around your home. Breeding grounds located a distance away may cause re-infestation with changing weather conditions and prevailing winds, so it is important to keep the BUG EATER on to break the breeding cycle again. When the surrounding conditions are right, with moisture & the right temperature, the females hatch in three days and start biting and breeding again. You may not wish to trap some varieties of moths or beetles if they are harmless to your environment or garden. To avoid this select a suitable size chicken, bird or snake mesh and cover the unit. These grubs/worms come from coddle moth or insects that lay under eves, fences, buildings or the soil. The BUG EATER has proven to be effective in preventing the hatching of the grubs. By catching the adult, the BUG EATER stops them laying one cocoon which can turn into hundreds of grubs. For best results place the BUG EATER under the eaves. The unit is extremely effective against many types of moths that are predators of the garden. The BUG EATER catch is ideal for analysis and monitoring the types of insects that are around. For organic growers and Agri-Business they can see which insects are in the tray and identify a possible problem before it happens. To examine what is being caught use a chux cloth to strain the catch for examination. It is worth noting that both types of black light mentioned on the first page are effective in different ways. It appears that sandflies are generally at their worst at certain times of the moon and tide cycles. It is suggested to watch for the 1st quarter of the moon. This is when they appear to be most active in tidal areas. Don't make the sandflies work too hard to get themselves drowned. Keep the bugeater lower to the ground ideally around 80cm to a metre (2-3 feet). A lot of success has been reported using the bugeater around horse stables to remove horse midge. Sandflies seem to relate to moon cycles in some ways. Experience, over many applications and uses of the BUG EATER, reveals that most insects do not travel far in a lifetime unless carried by a wind. It is worth noting that continued use, even when there are only few insects being caught, will reduce numbers and stop localized breeding grounds that may cause outbursts of large numbers when conditions are right..